Swinkles is sweet, spicy and sour at the same time and if you love sweet and sour candies, then Skwinkles by Lucas are the perfect candy for you. You'll love the sweet chewy texture of the chamoy candy flavored sticks, covered in delicious chili. Who Can resist the delicious Hot Chamoy Candy strips? Go wild over Skwinkles! 70 Calories per package 19.5g.Effem Mexico Inc. Lucas World. Mars Mexico. 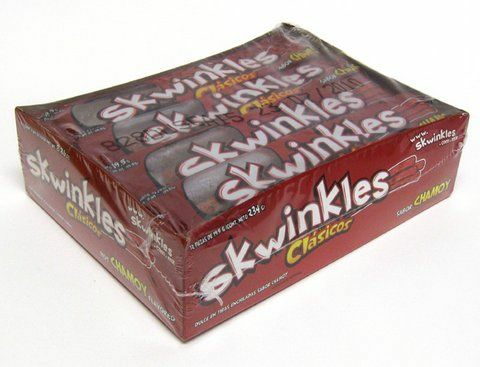 Los Skwinkles son dulces, enchilados y agridulces al mismo tiempo y en deliciosas tiras sabor Chamoy cubiertas con chile. Y Si te encantan las golosinas dulces y agridulces, los Skwinkles son perfectos para ti. Te fascinara la textura suave de las tiras enchiladas y su exquisito sabor. Quien se puede resistir a las tiras picositas de sabor chamoy? Vuelvete loco con Skwinkles! Dulce Mexicano (skuinkles. skuinqles. eskuinkles. skwinkles). 70 Calorias por paquete 19.5g. This candy has the right amount of sour in it. Took me back to my childhood. I've ordered it so many times already. I love it!